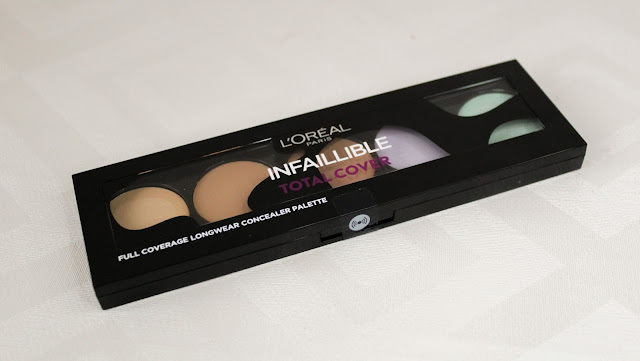 When I was purchasing the L'Oreal Total Cover Foundation I came across this concealer palette, now I am definitely all for a concealer palette that is able to cover redness, dark cirles and all my blemishes so I just had to pick this up and try it out, even though I wasn't too sure about the beige tones for covering blemishes. 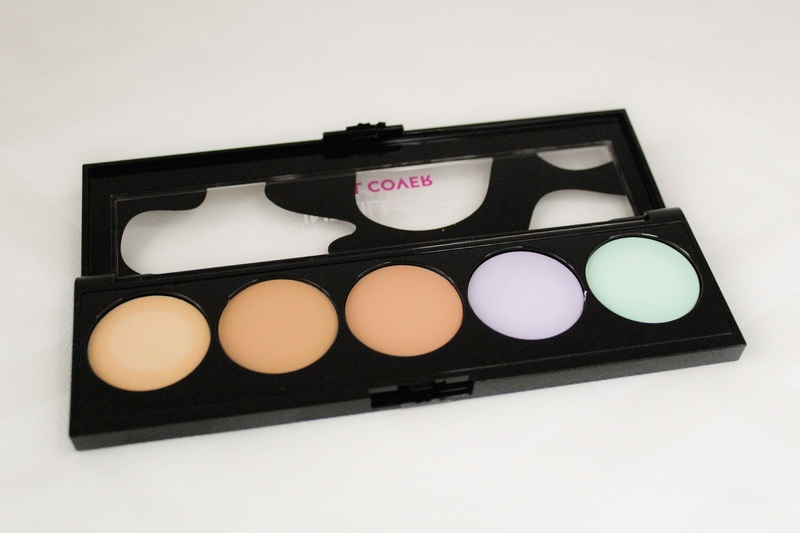 This concealer palette contains 5 different shades, three beige tones that are used for concealing, a green one to cover any redness you might have and also a purple one for correcting dark circles under the eyes. The concealer has a very creamy and thick consistency, you only need a little amount of it and a little does go a long way. The formula is very pigmented and surprisingly blends out really easily and well. I find that it is best to apply this with your fingers because it saves a lot of product but it also warms the products and makes it a little easier to blend out. I have also used these concealers with a beauty blender and I find that it works just as well but it does sheer it out a little more than using your fingers. I did notice that this concealer does cling to any dry patches that I have on my face so I probably won't use it around my nose area as that is where I get a lot of dry patches. The beige shades however are not light enough for my under eye area, they are okay for covering up blemishes but not for highlighting under the eye, which is a downfall as I didn't see this palette in any other shades and there is no shade name or anything on the packaging. With the green and purple shades, I like to apply them on to my face and then blend them out a little bit and put my foundation right over the top, this is the way that works best for me. My skin always looks that little bit better when I use this, especially when I have a really bad break out that needs covering or any redness. The packaging of this palette is plastic and quite compact which I like. The black patterns matches the Total Cover Foundation and it also has a little clear window where you can see the pans of concealer. Like I mentioned before, I'm not sure if this comes in any other shade ranges or if this is the only one because there is no name on the packaging. It also clicks shut so you know that it won't open and get dirty or anything like that and on the back it has a little picture with some information on which shade does what for your skin. Overall, I do think that this is a great palette for concealing and covering any blemishes, redness or dark circles that you might have. 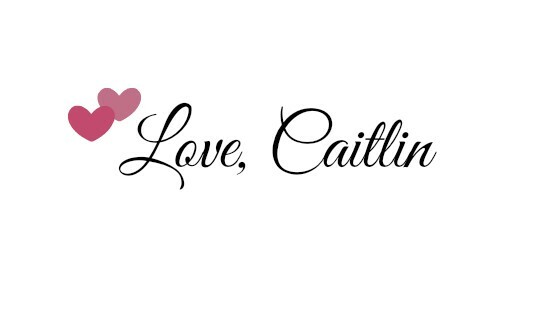 While the formula is good and only slightly thick but still pigmented and very creamy! I would say that you would definitely need to set this with some powder if you're wanting it to last all day. 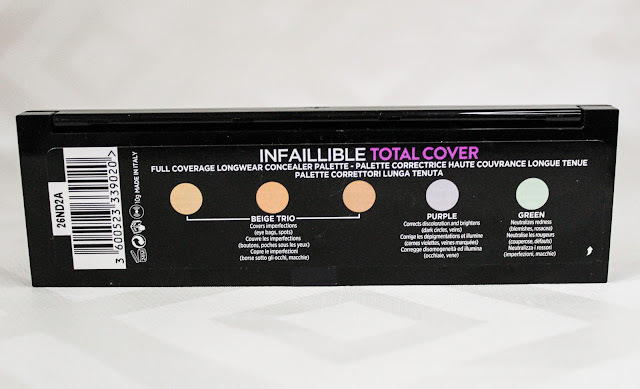 This palette definitely works for me however, like I mentioned before, if you are pale skinned like me then the beige colours will not work at highlighting your under eye area, so if you are looking for an under eye concealer palette and you're on the paler side, I would not recommend that you get this. But, if you are looking for something to colour correct with and to use for covering up blemishes and redness then this is definitely for you. The L'Oreal Infallible Total Cover Concealer Palette is £12.99 and you can pick it up from Boots online here. Have you tried out this palette yet, if so, what do you think? and what is your go to concealer to use? There are so many new products out in the drugstore at the minute I keep missing these wonderful products! The packaging is really cool too.